Since we launched Good Food on Every Table in 2013, FamilyFarmed has presented numerous in-depth, informative and sometimes inspirational stories about the farmers, entrepreneurs, businesses, investors, activists and others who are fueling the rise of the Good Food movement. But we have come to the realization that we haven’t shared much about…. us. The executives, board of directors and staff of FamilyFarmed talk the talk and walk the walk when it comes to Good Food. It’s not just a job, it’s a lifestyle. Most of us love to cook. We shop at farmers markets and groceries for locally and sustainably produced ingredients, and use them to prepare simple, delicious dishes at home. Some of us are avid gardeners. And we love to get out in the community to interact with urban and rural farmers, nonprofits that bring school gardens and food education to schoolchildren, and others who are growing the Good Food movement. 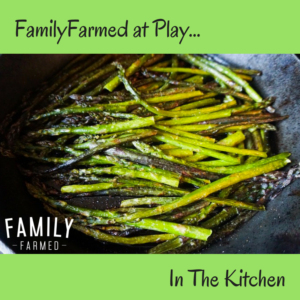 So you can get to know us better, we decided to start a series called FamilyFarmed at Play. It had a brief run as a social media-only feature, but we decided to add it to Good Food on Every Table because we were certainly having fun with it, and our Facebook friends seemed to be digging it too. This item below, about one of the easiest ways to make a tasty meal or snack, kicks off the series. Let’s us know what you think, we welcome the feedback. Okay, I admit it. When I first heard that there were restaurants featuring toast on their menus, I kind of rolled my eyes. It sounded a bit like a skit from Portlandia: So foodies are going to go to a restaurant and spend a lot of money for toasted bread? But then I figured out that this “toast” wasn’t just toast, but was bread (often of the artisan variety) topped with a variety of delicious ingredients — sort of like…. pizza? Pretty soon, avocado toast had become one of the hottest menu trends. In Chicago alone, there now are at least two restaurants named for this concept (Slightly Toasted and Toast). Truth is, there’s nothing remotely new about this. What the toast trend has done is elevate the age-old concept of the open-faced sandwich. Or you can call it a tartine and it sounds all French and classy. • Use the best bread your budget allows. A good loaf of bakery bread is just a modest upcharge from factory bread — a relatively cheap indulgence. We in Chicago are fortunate to have Publican Quality Bread pretty handy. The bread in the photo is an awesome PQB rye. • Go simple with your favorite meat, veggie and/or cheese for toppings, or let your imagination run wild. 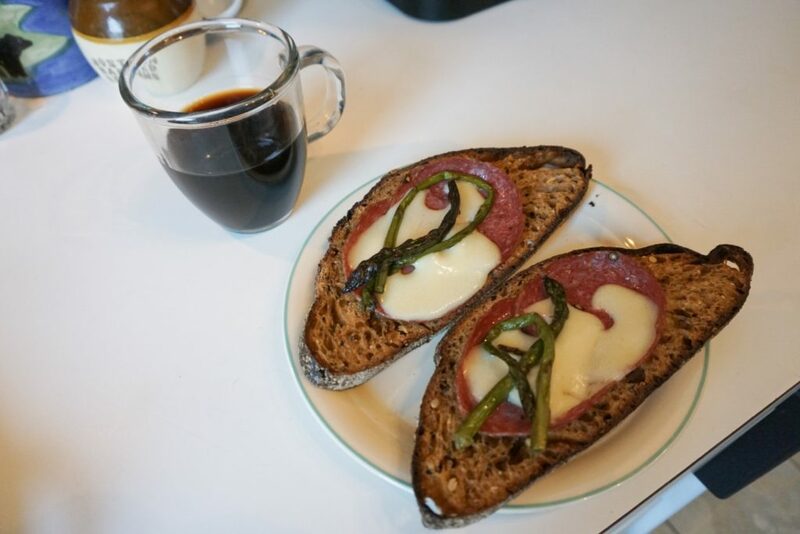 This toast is topped with house-made kosher salami from The Butcher & Larder at Chicago’s Local Foods store, baby swiss cheese from Hook’s in Wisconsin, and leftover roasted asparagus. Now, of course you can toast the bread in a pop-up toaster and then top it (maybe put it in the microwave for a few seconds). But there are few more noble purposes for a toaster oven, since you can watch the ingredients brown and the cheese (if you’re using) melt. It’s very entertaining. Kind of like a really laid-back version of the Food Network. This entry was posted in Culinary Trends, FamilyFarmed At Play, Good Food trends, home cooking and tagged FamilyFarmed at Play, Hook's, local foods, open-faced sandwich, Publican Quality Bread, tartine, The Butcher & Larder, toast. Bookmark the permalink.